For all class enquiries please contact CCPS on 02 4324 5343 or email us. 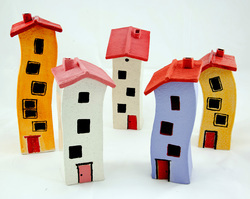 Don't hesitate to call us should you have a particular skill or area of working with clay you would like to explore. We are open to new ideas and there is always potential for new classes and specialist workshops. Interested in teaching ceramics at CCPS in 2016? We offer classes in hand building, wheel work and sculpture for all levels. Adult and children classes available. PLEASE NOTE: Class sizes are limited and inclusion in the class is dependent upon payment. Tutor is Shellie Christian, a member of the Central Coast Potters Society. Shellie is attending Hornsby TAFE. In this class she intends that students will build on skills of handbuilding and throwing. The class will discuss form and finish, design of pots. She will demonstrate methods of surface decoration using underglazes, oxides and drawing, including paper and wax resist, shellac, slips and scraffito. Students can work on their own projects or develop one with the tutor. Feel free to bring along any ideas to the class. Contact the Class Convenor for enquiries or bookings. Karin has been a member of the Central Coast Potters Society for many years and brings her wealth of experience to this class. You will enjoy the various aspects of hand building and wheel throwing. Click here/uploads/3/9/2/2/39225535/ccps_adultclasspromo_thu_morning_t1_2017.pdf for more information. Lynn is a very experienced potter who has been teaching pottery for many years. The classes include getting to know clay with handbuilding as well as beginner and experienced wheel throwing. Clay used is Keane’s stoneware, which when fired is waterproof, dishwasher and oven proof. Students can work on their own projects or develop one with the tutor. Feel free to bring along any ideas to the class. This will be a pottery class for beginners and Experienced students. We will explore interesting shapes, using slips and colour to decorate. 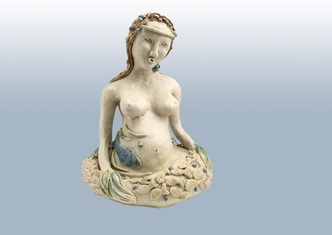 Discover the joy of Figurative Clay sculpture. Rachel is an experienced clay sculptor. Her pieces feature the female form and animals, especially horses. This term the theme will be creating small figures:-humans, animals or a combination of both. Work can be free standing or attached to another clay form as in the work in the picture. There will opportunity to explore and practice details including hands and feet. 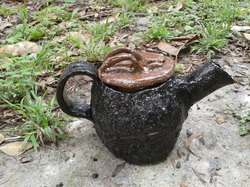 There will be a demonstration in week 1 which will show techniques in using the given clay. Numbers Are Limited, Early Bookings and Payment Essential. Additional clay and firings incur an additional fee. Please register your interest in any of the above classes with the Class Convenor using classes@ccpotters.org Payment details will be emailed on receipt of your enquiry. You will then be asked to fill out Registration details and make your payment preferably by direct deposit. Cheques and cash accepted by arrangement. Enrolment is dependent upon your payment being received (the Class Convenor does not receive the payment). To ensure your payment can be identified, please tag payment with your name and class indicator. There are 10 places in each class and they tend to fill quickly. Libby is experienced with children and clay. She offers quirky, interesting projects for her students. Each child is encouraged to work imaginatively with the medium. Clay used is Keanes Earthenware. We hope the above classes will spark your interest. Click here for the application form. Please do not make payments for a class until you have confirmation from the Course Convenor. * Cheques are payable to: Central Coast Potters Society Inc.
GENERAL ENQUIRIES - Central Coast Potters Society 02 4324 5343 or email the Class Convenor.